The leaves are changing to gold, morning dew has turned to morning frost and your summer sleeping bag isn’t protecting you from the chill anymore. The question of what kind of bag to buy, though, is not just seasonal. Whether you want down insulation—better warmth for weight ration—or synthetic filling, which is cheaper and hardier, is a perennial consideration. Full zip, mummy bags, or full hood are all things you should consider for keeping you warm in the cold months. This traffic cone orange bag will make sure you’re highly visible in the snow and the goose down filling will keep you snug on your backcountry adventures. The zero-degree bag weighs 2 pounds and 9 ounces and packs down to a little under 10 liters. The hood also features a drawcord so you can ensure your head stays tucked in and warm all night. Never against resign yourself to a sleepless night outside. 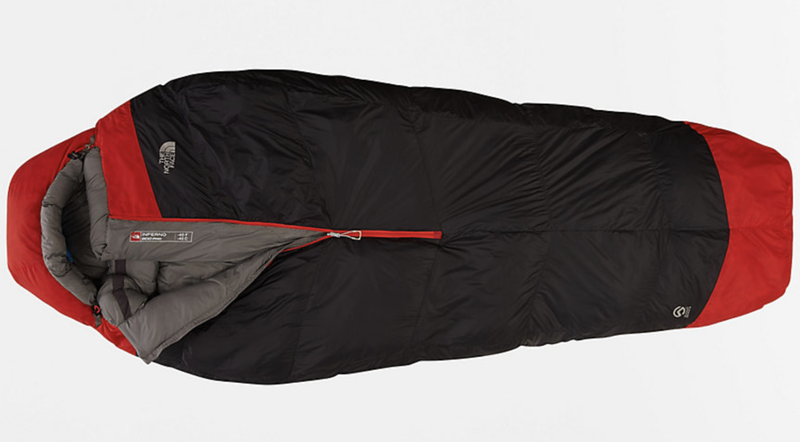 The Zenbivy is not your typical sleeping bag. Instead of constricting you inside, the bag has zippers on both sides and is designed to let you sleep in any position you choose. It also attaches to your sleeping pad to keep you from sliding around at 3 a.m. While not comfortable for temperatures beneath 25 degrees, the bag packs down to about 2 pounds. The creator of the bag raised more than $120,000 on Kickstarter to bring his design into retail sale. The Inferno is meant for the coldest places on earth (not, as the name suggests, a fire). Is designed to keep you toasty even when the wind is howling and the mercury is dropping far past zero degrees. At about 4.5 pounds, the -40 degree down bag is hefty. It’s the warmest sleeping option the company makes. If you don’t have hundreds of dollars to drop, the zero-degree Teton Sports Celsius will get the job done. It weighs 5 pounds and doesn’t pack down to a small size but, hey, it’s less than $100. The bag does not have a mummy shape or hood, so make sure to pack a hat to keeps your ears from freezing. On the bright side, the inside is soft, flannel-like material and two bags can be easily zipped together for winter cuddling. Yes, the price is labeled “discretionary” and the product ships from overseas, but Nanja’s all-down zero degree bag is made for kings (and queens). The company hand selects all of its down by hand in Europe. The zipper even glows so it’s easy to see in the dark. The startup company also offers free lifetime repairs on all of its sleeping bags. JOIN THE REDDYYETI COMMUNITY AND HAVE INNOVATIVE & UNIQUE OUTDOOR STARTUPS DELIVERED TO YOUR INBOX.